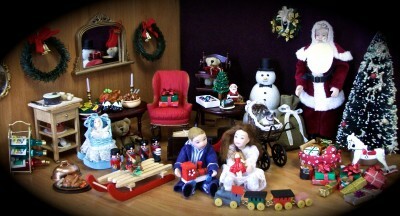 Some of our wonderful display houses, complete with furniture and dolls, are now available to buy from our Ripley showroom. The showroom will be closing its doors on January 24th, as we move over fully to internet, telephone and postal ordering that you use already. 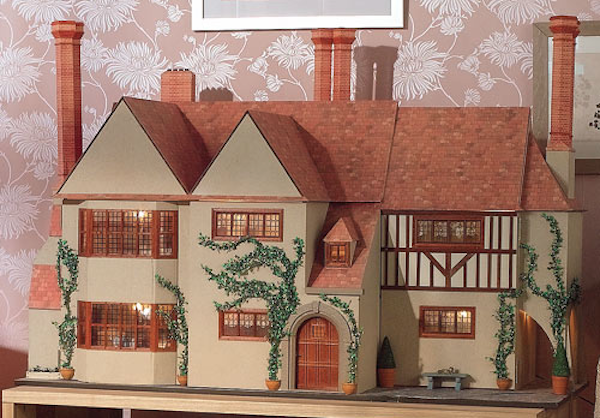 It’s your chance to get along and buy some of the showpiece models which have wowed customers over the years! 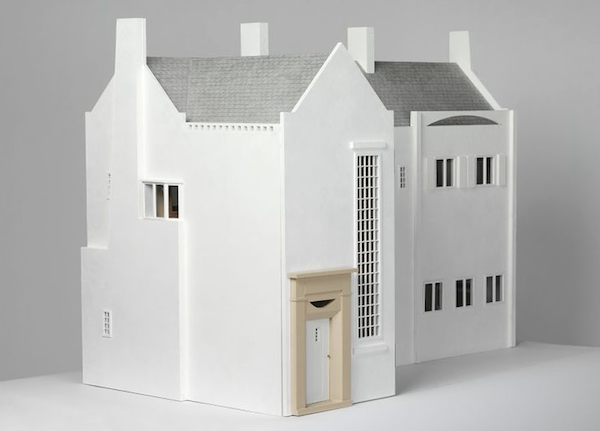 Rare models include our discontinued Lutyens house and the MacIntosh house, which have both been on display in the foyer. Highlights include two versions of Montgomery Hall, one traditionally furnished and the other dressed as Miss Havisham’s house from Great Expectations, complete with Pip and Estella dolls! We have two Lake Views on offers, one in light wood and one in dark, both with their garden rooms. There are two versions of Malibu Beach House, and two Amber House models too – all fully built, decorated, lit and furnished. The biggest bargain on offer has to be Grosvenor Hall, with its basement, priced at just £1,150! The regular retail price for a built house alone is £2,500 and this one is fully furnished. They’re all available on a first-come, first-served basis and need to be collected and taken away by the customer. Looking for somewhere to spend your Christmas money? Look no further - we have 100s of items still reduced, but they won't be discounted for ever! Highlights this week include the Cumberland Castle East Wing Kit (1639) with 30% OFF and now just £77. With FREE delivery on orders over £50 it makes sense (like Santa) to write your list and check it twice! You can also pop over to our Ripley showroom and shop to pick up your bargains before January 24th, when it closes as we move over fully to internet, telephone and postal ordering that you use already. As always, we're here to help so call the customer service team on 01332 912989 if you have any questions or queries before you start - or even if you're half-way through a project! Visit the website and sign in to see your latest offers, then make your choice and get in touch online or by phone! It has been a year of change here at The Dolls House Emporium, and we're now looking forward to helping you enjoy your hobby "to the max" in the coming days, months and years. With the New Year comes one more change here at Dolls' House HQ. Our showroom at Ripley will be closing its doors for the last time on 24th January as we complete our work to transfer to online shopping. The business will continue online, by phone and by post - as always. We already meet the bulk of our customers' needs via the internet and when you visit dollshouse.co.uk you can browse all of our products, download the new handbook free of charge and see all of the latest bargains and offers 24 hours a day. You will still be able to get the usual help, advice and support from our customer service advisors - and place your orders as always - by calling 01332 912 989 and we look forward to helping you with your magical hobby into 2014 and beyond. In the meantime, if you are able to visit the on-site showroom one last time, you'll be sure to find some very special offers as we empty the shelves... and some of our famous display houses may be available to buy too. We’re open seven days a week, 10am-4pm, except for New Year's Day, when we have a little rest! Today is cyber Monday, when people wake up and realise that it will soon be Christmas - and they’d better start buying presents! 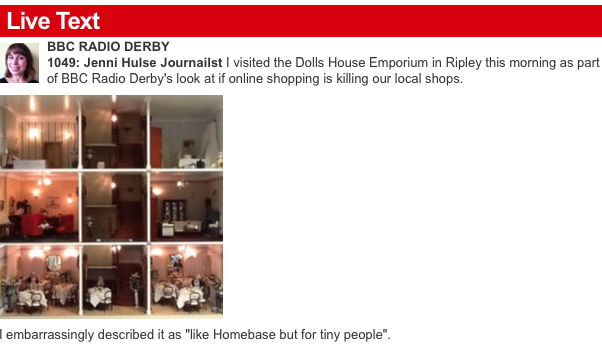 BBC Radio Derby’s Jenni Hulse visited the Dolls House Emporium in Ripley, when she described herself as being surrounded by some “really impressive” models. She was joined by managing director Colin Tilson who told her: “Cyber Monday is very important and indicates the start of the big peak towards Christmas. “In previous years its been in November but being in December makes a big difference. I’d expect an uplift of up to 50% compared to November. It’s going to be in the region of 300 orders a day. Asked about where the potential conflict of shop versus online sales, Colin told her: “There’s that battle going on but it’s the way that it is these days and we have to make the most of the situation. Our focus is going to be online, really. Christmas time isn't ALL mistletoe and wine - although these are two of the things we like to have plenty of when the festive season arrives! It's time to start planning your miniature Christmas display - whether you're working on a decoration or diorama scene, or dusting down and rejuvenating one you put away in the loft last January. There are lots of colourful seasonal offerings festooned both online and across page five of our monthly offers brochure, now available to download FREE in a new digital format. So take time to look at our wonderful seasonal specials, as well as the latest offers, ideas and new products. And there's more great news if you are ready to improve your dolls' house or miniature scene... we've cut the prices on over 1,000 products! There are massive savings - of up to 80% in some cases - and far to many to list here so tap through to the website and click on the Special Offers section to browse. You can now order our new season Handbook for swift delivery AND be fully reimbursed with your next order over £45. We've dropped the trigger purchase figure so that you can get all your Christmas goodies ordered in time for the big day! You can get the usual help, advice and support from our customer service advisors by calling 01332 912 989 and we look forward to continuing to help you with your magical hobby into 2014 and beyond. In the meantime, if you are able to visit the shop, you'll be sure to find some very special offers and cracking Christmas gifts! Whatever you are looking for, it's a very good time to add to your collection! Visit our Ripley shop: NEW room displays on display!